This creamy and sweet butter has been triple whipped into a fluffy treat for your skin. 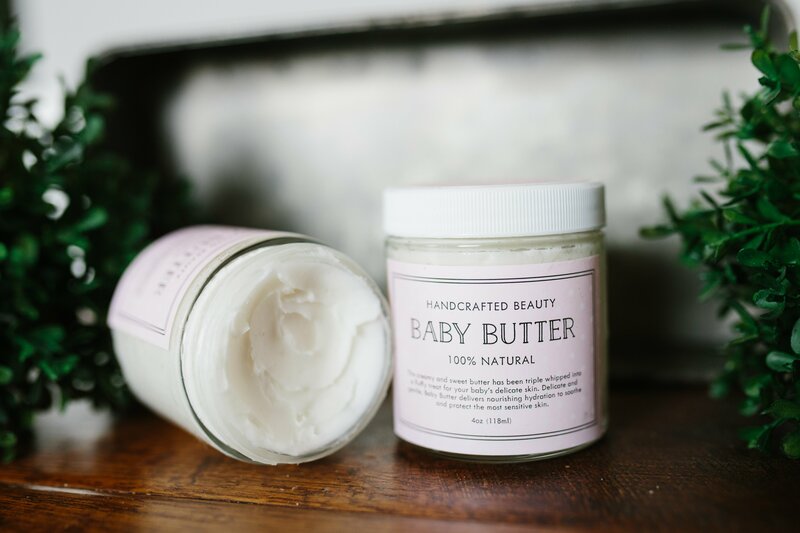 Delicate and gentle, Baby Butter delivers nourishing hydration to soothe and protect the most sensitive skin. Apply as needed; gently massage into skin. Avoid eyes and mouth. Store in a cool dry place. Temps over 76 F may change the consistency but not the integrity of the butter. Shea Butter: With a high concentration of vitamins and rich fatty acids, shea smooths, conditions, and intensely moisturizes the skin. Mango Butter: The Vitamin C helps to brighten skin, while Vitamin A reduces fine lines. A rich moisturizer therefore soothing and healing. Jojoba Oil: Contains almost all of the vitamins and minerals essential for healthy skin. Jojoba mimics your own natural oils, and it is this balancing act that ensures your skin is deeply hydrated and nourished. I just recently received my Baby Butter and there aren’t enough words to express how amazing it is!! It leaves my baby’s skin SO soft! I let a friend borrow it for her little one who had really bad eczema and it cleared it up over night and she insisted for more Baby Butter! I HIGHLY recommend!